As the first home sewing company to bring you longarm quilting, Baby Lock is proud to introduce the Tiara III. Home quilters interested in finishing projects with polish will love the compact Tiara III quilting machine. This smooth operating machine sews up to 1,800 stitches per minute and comes with its own table so you can be ready to quilt right away. The included new quick-set tension allows you to easily adjust upper thread tension and view your settings on the digital LCD readout. 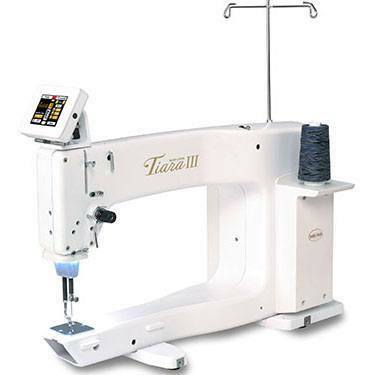 With a work space measuring 16 inches to the right of the needle by 8.25 inches high, the Tiara III has more space than the average sewing machine. Even so, it is a compact sit-down machine that’s ideal for your first step into the world of longarm quilting.